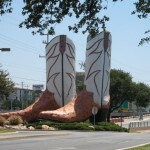 Here’s something kind of authentically Texan: a shopping mall that’s home to “the world’s largest pair of cowboy boots,” a 40′ sculpture outside of Saks Fifth Avenue. Pretty wild! San Antonio, Texas is a large and sprawling metropolitan area of just over two million people in south-central Texas, and is home to many of Texas’ oldest landmarks (including, most notably, the Alamo). In recent decades, development sprawled almost un-checked in every direction radiating from downtown to such a great degree that the city had to build beltways around beltways. Most of the city’s major shopping malls were built around what is now the “inner” of these two beltways–I-410–and most of *those* malls are clustered along the city’s northern half. 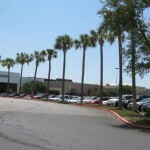 Of these, North Star Mall is the largest and most successful of the fully enclosed malls near San Antonio (there is one newer outdoor mall that arguably has since rivaled it). The North Star Mall is a 200 store, 1.2 million square foot enclosed mall anchored by Dillard’s, JC Penney, Macy’s, and Saks Fifth Avenue. 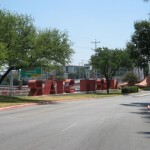 Originally developed in 1960 by Community Research & Development Corporation (which would later become The Rouse Company), the mall was initially a far smaller center anchored by Wolff and Marx, H-E-B, and Walgreens, along with about 50 in-line merchants. Shortly thereafter, the mall was expanded slightly to include a movie theatre and a new anchor in Frost Bros. By the end of the decade, the mall underwent another expansion, with Wolff and Marx moving to a new five level store and renaming themselves Joske’s. Also, in 1968, North Star got a buddy–the adjacent Central Park Mall, just across San Pedro Avenue. The 650,000 square foot mall was anchored by Sears and Dillard’s and was, for some time, something of a twin for North Star. You can see a 1982 aerial photo of the mall here. 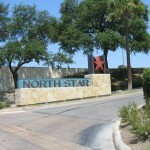 But the continued expansions at North Star would ultimately bring its demise. The landmark cowboy boots showed up in 1980. Named “The Giant Justins,” and built by artist Bob “Daddy-O” Wade (What a Texan name! ), the boots were originally constructed a year earlier for the Washington Project for the Arts. 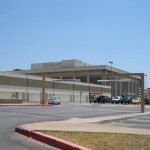 The arrival of the giant kicks kicked off a 1982 revival at the North Star Mall, wherein the center began a major renovation to add a food court and a sub-terranean “music court” as well as add a Foley’s on the original H-E-B site. Three years later, Saks Fifth Avenue was added as yet another anchor. 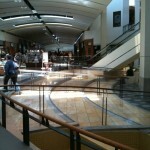 Only a year after the arrival of Sak’s, a new two-level wing was added to the mall, including Marshall Field’s and a new food court. In 1987, Joske’s was acquired by Dillard’s, while Frost Bros. went out of business in 1989 and was replaced three years later by Mervyn’s. Marshall Field’s exited the Texas market in 1997 and their store was converted to Macy’s. In 2001, the now-dwarfed Central Park Mall packed it in. It was mostly demolished in 2003 although Sears still remains. 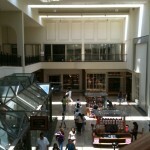 The original section of the mall is the upper “T,” closest to Dillard’s and Saks. This was originally a one-level mall that received a second level and then was soon thereafter twinned (with the lower “T”) in the mid-80s. Strangely, the second level on either side of the mall is discontiguous, meaning that the only way to walk through the entire center is by going downstairs to the main, first level. The passageway between the two “T” areas is somewhat narrow and winding. The floorplan at the North Star Mall alone kept me pretty entertained, but even aside from the weird layout the place just felt immense. With all of the various additions over the years, the mall doesn’t have much stylistic consistency, creating all sorts of nooks and crannies and twists and turns that look different from each other. All in all, it was a pretty exciting place. And, as I mentioned earlier, although North Star Mall is San Antonio’s largest and most successful enclosed mall, it’s facing some tough competition. The very large Shops at La Cantera, a massive outdoor mall/lifestyle center, opened far northwest of the city in phases beginning in 2005. In sheer size, this place seems even bigger than North Star and appears to have an even more upscale roster of tenants, without any of the vacancies that plague North Star (which still hasn’t filled the Mervyn’s space that was vacated a year and a half ago. Actually, whoops: Forever 21 plans to open a store to fill the vacant Mervyn’s). – You can see a Foley’s labelscar below the Macy’s sign. I miss Foley’s…the Marshall Field’s of Texas, as it were. – The Wikipedia article mentions a basement court that was sealed in the 1990s. Did you see any evidence? 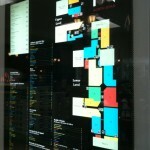 – I thought the mall was one level until now! Cool! – The Mervyn’s storefront looks very similar to Sanger-Harris (sans mural) but it never was a Sanger-Harris. 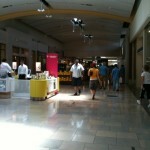 – I went to The Shops at La Cantera in 2006. At the time, the second phase was not complete and Foley’s was mere months away from perishing forever. It didn’t seem particularly upscale (as in, nice but nothing to write home about) and all the storefronts opened up with no doors (the air conditioning just goes out the entrance…). The concourse was very hot (except for the food court, which was enclosed) and the hallways were strangely empty (yet the parking lot was full). Given that it was my first outdoor mall experience, it was quite strange. – Texas is now fourth, behind Massachusetts, Illinois, and New York. Wow! Though I think I would really enjoyed some pictures of what the Marshall Field’s (JCPenney) looked like as part of the post, I love this entry overall. This is one of the oddest malls I’ve ever seen. Parts of the interior are stunning, and the other parts are at least historic. I really dig the old Frost Brothers and a five level Dillard’s sounds intriguing and looks kind of cool. Love the boots! Surprising they just didn’t make the entire mall two floors. I hope the dry fountains in the pics aren’t eventually demolished. 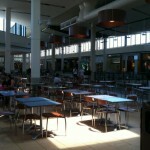 The interior looks eerily similar to The Mall in Columbia in MD and Paramus Park in NJ. 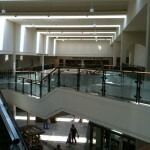 I guess General Growth is going for a similar look in all the malls it renovates. 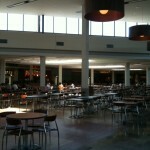 The layout is kind of like Southland Center in Taylor, squared. Also, I looked up Central Park Mall on Bing Maps. The site is still vacant, with only the Sears, vacant Dillard’s and office tower remaining. You can still see the outlines of the mall hallways. 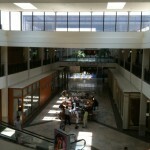 *McCrelless Mall: Bealls, Handy Andy, Montgomery Ward, Woolworth and I think JCPenney. It was demo’d sometime this decade and is now an H-E-B. 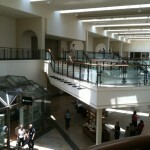 *Rivercenter: Opened in 1988, home to Macy’s and a dead Dillard’s. *Rolling Oaks: Fairly normal JCPenney, Macy’s, Sears, Dillard’s. *South Park Mall: Bealls, JCP, Macy’s, Old Navy, Sears (which was formerly a *Phar-Mor* of all things, if for only a year — was this Phar-Mor ever something else before that? ), and a dead Mervyns (which was formerly a *Woolco*!). This may be one of the only malls formerly anchored by Woolco that isn’t circling the drain. 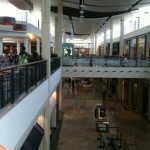 *Shops at La Cantera: Outdoor mall with Dillard’s, Macy’s, Neiman Marcus, Nordstrom. 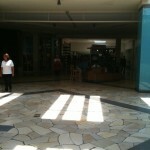 * Westlakes Mall: Small discount mall that didn’t stand a chance. Opened in 1983 with Target and Wards, demo’d 2008 (save for Target) for another H-E-B. 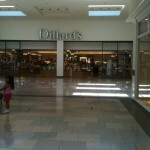 *Windsor Park Mall: Dillard’s, Dillard’s Home (née Joske’s), JCPenney, Mervyn’s, Wards. Mervyns was the last to go, doing so in 2005. Converted to something for Rackspace. @TenPoundHammer: Nearly all the Macy’s in San Antonio were originally Foley’s, and Rivercenter’s Dillard’s was originally the flagship Joske’s. Macy’s was Foley’s, and before that, Lord & Taylor. 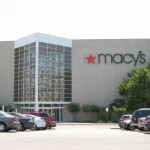 @Jonah Norason (Pseudo3D), Actually all the Macy’s in San Antonio were originally Foley’s as the only Macy’s in San Antonio (North Star) is now JCPenny and the larger, former Foley’s in the mall was converted to Macy’s. Also, to clarify for others, the Rivercenter Macy’s was previously a Lord & TYlor prior to becoming Foley’s. Didn’t North Star have a Rhodes Southwest (later Liberty House) in the 1960’s and 70’s? 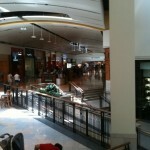 @Paul, Actually that was at Wonderland Mall (Crossroads Mall). The space eventually became a Frost Bros. and is now Burlington Coat Factory. 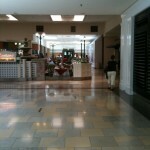 @Paul, You are correct about the Rhodes at North Star Mall. 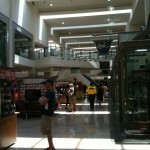 I was in what is now the center of the mall, and had the basement as the lower level. 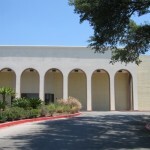 When Rhodes (later Liberty House) closed this and the Wonderland store, North Star made the upper floor a major entrance with shops on each side, and the basement, with the 2 escalators, had the music and record stores with their own court (Alamo Music, Caldwell Music, Dyer Electronics, and a few small shops). It was sealed in 1990 and is used for service space & storage for the mall staff. I left San Antonio in 1988 and the mall has contiued to grow. 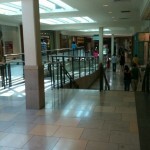 The mall second levels don’t meet because they were added at different times of renovation. A great place to shop and meet friends. The Mervyn’s here closed in August ’08, the next-to-last round of closings. So it wasn’t vacant for over a year, at the time of your writing. P.S. : Contrary to what Wiki says, Wolff & Marx didn’t “rename” themselves Joske’s. Joske’s bought out Wolff & Marx, built a new giant Joske’s store, and closed Wolff & Marx. That would be like Marshall Field’s “renaming” themselves Macy’s! It should be noted that at one time there was talk of building a crosswalk over San Pedro to join Central Park Mall & North Star..turning Central Park Mall into more of an entertainment style(clubs, theaters, restaurants etc..) venue to compliment North Star..there was even talk at one point of building a quasi-style underground tram between the two..shame that never occurred..
Where the heck are Caldor and Prangeway? They’re not usually gone this long. I have an six-page ad for the opening of the General Cinema twin theatre. There is a lot of history at the link below. This complaint is against North Star Mall(San Antonio, TX) Management, Lens Crafters Management, North Star Security and SAPD for an incident which occurred on 11/17/2009. This officer, security, and other personnel were highly insulting, humiliating and continuously tried to provoke me so that he had reason to arrest me. I have no doubt that by the arrogance displayed in this incident that other complaints exists against the individuals involved and others may be forthcoming. I high recommend that you investigate this matter. My account is stated below, along with my police report. I am deeply upset and dissatisfied with the way that I was handled by North Star Mall security and the assigned Police Officer, on today 11/17/2009. Specifically, I would like to file a complaint and report for this incident. Today I went to Lens Crafters and my $ 300 cell phone was stolen from the store counter while I was in the store. I used the phone in front of Lens Crafters employees for I called Lens Crafters Customer Service from the store. After sitting with Brittany to price glasses, I sat my phone on the customer counter. I walked away to replace a pair of display glasses and my phone was gone. At the time there were about 4 employees in the store, and one customer. I insisted on filing a report and complaint to make Lens Crafters and the mall aware of the incident, but constantly got the runaround, being told that I could file the complaint on line, there was no phone number to call. Unbeknownst to me, security was called, Mr. Mendoza. He spoke to me and seemed helpful at first. He then told me that an officer would come to take the report, Officer Ingram. I told him that I would walk to my car and return. I gave him my second cell phone number in case I missed him. As I walked to the car, 3 officers approached me, Ingram asked “may I help you”. I told him no, for I did not know that he was the one that Mendoza called. Igram did not asked me if I needed help with my phone situation so I figured that I would wait until I returned to Mendoza. Immediately officer Ingram exerted his authority, through me against the wall, handcuffed me and threatened to arrest me if I said one word. As on lookers watched, he asked that at most I could shake my head as he asked questions, and if I said one word he would arrest me. Mendoza then said to me “You really fucked up now”, while Officer Jason told him he should not have said those words. Ingram was very much in my face trying to provoke me to get arrested. I did not allow this to happen and was released. I was told by Lens Crafters and by Mendoza that I could file a complaint and incident report and I wanted to. I still do. But, I was told by Ingram that there was no such complaint that I could file and that if I wanted to file a report with the police department nothing would happen, but I could try to do so on line. I have never been so humiliated in my life. I am a black man. All parties involved were Latino or White. This felt really strange. Additionally, Lens Crafter employees were very customer unfriendly. Particularly Brian, the manager on duty. He did not want to come to speak with me about this matter, though Brittany tried vigorously. He tried to bribe me by offering deep discounts on glasses for the humiliation. I told him that it would not erase the humiliation and he shouted to Mendoza, “take him away from my store”. Michael, another Lens Crafters employees “freaked out” (according to Brittany as well) for some reason and became arrogant and argumentative with me about the matter, though he was marginally involved. He showed me his iPhone and argued that he had no reason to steal my phone, though I never accused him of stealing it. Ultimately, Michael called security. Brian then came out explaining that security was called to help me file a report. Little did I know they were called to harass and torment me. I know that I had and used my phone in the Lens Crafter store. There was a total of 4 employees in the store (George, Brian, Michael, and Brittany), and one customer. There is a possibility that my phone was stolen by one of the employees and I wanted to report the incident. I was never able to report the incident, but am now sending this email to you, and will contact the SA Police Department. Eventually, I did get the phone number of the Lens Crafters Regional Manager, Terry Garcia, from Brittany. I left a voice mail with her and 2 with North Star Mall management. I do believe that Brittany was trying to be helpful. The fact the Lens Crafters staff, SAPD, and North Star Mall security was so demeaning and humiliating for someone who broke no laws, is something that you should seriously investigate, if North Star Mall management cares. If not, I have no doubt that everyone’s absence of politeness will flare up into a more significant problem some day. As for me, I never plan to go to your mall to shop (nor Lens Crafters) and fill out reports on this matter, post blogs, inform friends, management, media and authorities. What a horrific experience! You really should investigate this matter and let me know how to go about filing a formal report and complaint. @Kevin Vidal, If you are dissatisfied with your treatment by all parties involved, including the police, it sounds like you need to hire a lawyer. @Prange Way, Blog Reply – 11/18/2009 – I do appreciate your reply. This incident is still unsetting to me. I just spoke to a regional manager at Lens Crafters, Terry Garcia. She was very unapologetic and said that she “stands by the integrity of her employees”. She did not care to receive this incident in writing from me, though it contains additional details. She listened to my store summarized on the phone and told me that I would never hear from her again regarding this matter. She relinquished Lens Crafters’ responsibility to formally investigate this matter. She tended to point responsibility for this matter to mall security and the SAPD. ….”not in her control”. I have since written the TV Stations, North Star Mall’s parent company, Lens Crafters’ parent company (in Italy), and the mayor, Julian Castro. I have not heard from any of them on their own accord. I did speak with the San Antonio Police Department. They did not return my calls, nor did they respond to emails or on line forms. The officer I called told me that he has to finish speaking with the mall and Lens Crafters, then he will decide if he will “even take my case”. North Star Mall management never responded to calls, or emails either. I called them and spoke to Operations Manager Dave Stetler. He told me that he would look into this matter, but did not offer to follow up with me. I do not expect a response either. I am simply trying to shed light on the treatment I experienced. I am sure that others have experienced the same, but as citizens and consumers we never take action. My actions may seem in vain, but I am proud that I am not “taking this lying down”. I am more interested in sharing this situation with the community, and management who both can effect changes. At this time I am not considering legal action. I send you very warm regards for your reply. The more responses I receive, the more this story gets circulated. @Kevin Vidal, so let me get this straight you lost your phone, you don’t know who took it, you cause such a scene in the store that security was called then caused a greater scene that a security officer had to call for police back-up and they are wrong? Your an idiot and you should have been arrested!!!!!!! @Kevin Vidal, I was just wondering if you had a second phone, why didn’t you use it to call the first phone or you could have also used the store phone to call the phone. (Unless you had the first phone set on vibrate mode.) If the phone was not set on vibrate, you would have known instantly if someone had it on them in the store. I just did a Google search on SAPD Officer Robert Ingram. I am pretty sure that this is the officer that humiliated me, for he too is a on retail mall detal. He shoot a suspect for “fear of his life”. The suspect only had a hunting knife inside of his car. Ingram continued to fire as he was able to exit his patrol car and flee for cover. The suspect was hit by Officer Ingram’s fire and subsequently died at the scene. Officer Ingram did not receive serious injuries from the ramming of his patrol car. identification and the notification of death to the next of kin. administrative duty while the investigation continues. There are shortcomings in your assessment of facts. It is okay for you to feel the way that you do. It is not a crime to be unaware. I did not cause a scene though this will be the angle from which I will be pursued. It seems reasonable that if someone causes a scene security/police should be called for assistance. But I did not. I was persistent, not accepting that Lens Crafters had no available manager, no customer service phone number, and would not record that the incident occurred. I did not cause a scene, but at the same time I did not back down. When I left the Lens Crafter store, I was not escorted by security. I actually greeted security and walked with them back to the store. Security was presented as “helpful”. They came under the guise of assisting me to file a lost/stolen report. My discussion with security was very amicable. If any tension ensued, it was propagated by Lens Crafter employees Michael and Brian, and security guard Mendoza. On my way from the security office Mendoza, I was surprisingly handled aggressively physically and verbally, by SAPD and security. If their goal was to diffuse an “unruly” situation (which it was not), their aggression was inappropriate and over the top. I believe that their actions were more about their own shortcomings not mine. If only I were aggreesive and unruly, or had drugs or weapons, I would have played right into security and SAPD’s plans. But I was calm and had not broken any law. I had no weapons or drugs. Otherwise I would have been arrested. I was not, and was let go. I guess I was raised differently than you. I learned during adolescence not to call people names such as idiot, especially when I did not know them or was not present in situations involving them. For the record, I am highly educated, well travelled, and have worked for many of the largest corporations on the planet, including Ford, Toyota, Boeing, etc. Unfortunately, I was profiled as the antithesis of this. Their bad, not mine. You may want to note that the officer who was abusive recently killed someone at a mall. Perhaps you are not aware that SAPD has a serious issue with police abuse, particularly amongst blacks. We shall see how this all plays out. I don’t think you are an idiot. I just see you as unaware. We all need time to evolve into awareness. Give it time. You will too. Thanks to video surveillance, my actions and theirs is on tape. It will speak for itself, if does not mysteriously disappear. @Kevin, You are an idiot police and security do not show up for no reason. If you lost you phone that is your fault and no one elses! You lack personal responsablitly. I think you should have been arrested for disturbing the peace. And you need look at your self and see that you were wrong. It’s just easier to blame everyone else then admit your wrong doing. If you really thought a employee at lenscrafter took your phone you should have called the police yourself and waited instead of blowing your top. Simplely because your black doesn’t mean you were treated unfairly. You need to move on and get on with your life. I wanted to inform you of my decision not to pursue filing an SAPD Internal Affairs complaint. Coming to this conclusion was not easy for I assure you that the incident as I presented did occur. In spite of knowing the mall surveillance tapes would vindicate me, I still feel that the best decision at this time is to drop this matter. •	Only the complainant (me) is subjected to the above requirements, but not witnesses involved in the incident. 2. Lawyers, whose primary interest is making money off of my misfortune. I never had interest in filing suit against anyone. I have maintained that I was only interested in preventing the treatment that I experienced from happening to anyone else. I worked briefly with one attorney, Melaina Hood, who wanted to charge over $ 3000 just to sit in the Internal Affairs interview with me. ….this was not to file a suit….just to sit in the Internal Affairs interview. 3. Fear of retaliation. I have searched the net to find numerous stories of unethical, as well as questionable SAPD Officer’s behavior and practices. This includes the very officer who was abusive to me. It is for this reason that I have posted my experience on the web to make it public knowledge. Similarly, I have found numerous complaints on North Star Mall and LensCrafters that seem to have gone nowhere. 4. I have informed the public of this. I have posted my experience to the web on various blogs. I have received support and feedback from others, including attorneys trying to encourage me to sue. Again, I am not interested in suing. I am only interested in civic responsibility. 5. Avoidance of stress. I came to realize that pursuing SAPD will be very stressful and could be damaging to my health. 6. No confidence. I don’t feel that anything will ever be done to rectify my concerns. I now realize that the SAPD has had more significant police abuse complaints that go back to the 1960’s and 1970’s, many involving minorities. I believe that the federal government has had to intervene historically. There seems to be a very deep rooted problem with SAPD. 7. So far, no or marginal follow-through. I have written and called the mayor’s office, the US Justice Department, the San Antonio City Council, and various other private and public agencies. I never expected anything miraculous to happen with regard to these communications, but do feel good that I put the story out there so that perhaps on the 1000th such complaint, someone will “get it”. Again, the most responsive individuals have been attorneys interested in “a buck”. I avoided them, though. I hopeful that LensCrafters and North Star Mall will respond with the results of their investigation, but will not hold my breath on this. I want to make it unequivocally that I am telling the truth, and posed no threat verbally or otherwise to justify the treatment that I experience from SAPD, Lens Crafters, and North Star Mall. God is my witness, as well as North Star Mall surveillance tapes. I was profiled by SAPD, North Star Mall security and LensCrafters. Unfortunate to each of you, I am not a criminal or thug, but instead a well educated and well travelled citizen. However, I will not proceed with the SAPD Internal Affairs complaint for the process/system is too intimidating and all the odds seem to be stacked against an honest citizen who wants to make “bad things” good. This is unfortunate, but “it is what it is”. I have found some relief in the fact that I have voiced, documented, and publicized my concerns about North Star Mall, LensCrafters and SAPD. In fact, this email to you will be published on the web, by the time you read it. Wow, as my monicker proclaims, I am “not shocked.” Nor should anyone be shocked that someone as ridiculous and self absorbed as you appear to be would let alone cause a scene, but then instead of realizing you were wrong and immature, you blame everyone else for your actions. You sir were obviously not abused or you would have been writing your rants from a hospital bed or a jail cell. funny even your own description of the events points to you not others as to blame. Wake up, in todays world there is no room for such nonsense and closemindedness. Are we to be impressed that you, a common thug can use a computer? You appear to be the only racist is your story. I hope you are not the type of people representative of San Antonio. You are entitled to an opinion, just as I am. I can clearly identify myself as the individual who experienced the events that I describe. Who are your? You, on the other hand, do not identify that you were present or involved in this matter. You are merely guessing based on whatever guides your opinions. …not sure….but its not wise. I stand by my story for it is a fact. It is interesting that, in this day and age of “big brother” and surveillance cameras, that North Star Mall will not release video to me, Lens Crafters or anyone interested in reviewing them. The video would certainly set the record straight. The SAPD and North Star’s abuse was recorded. I dare them to release the tapes. I visited to mall yesterday to conclude that there were video cameras in most of the area that I walked and where the abuse occurred. On it, you will see me speaking with North Star Security under the guise of them filing a stolen phone report. The conversation was amicable and helpful, I thought. You will see me walking calmly towards the North Star Mall exit. You will see that I was abruptly, and for not reason apprehended and humiliated both by North Star Mall security and SAPD. I am particularly glad that unaware folks like yourself, SAPD Police Officer Ingram, Lens Crafters, and North Star Mall act the way they do. It is important to be aware of the sentiments out there and what others might be confronted with, when guards are down. – I identified myself Kevin Vidal: You are who? I was present at this event; Were You? 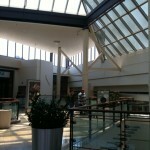 I dare North Star Mall to release the video surveillance, and challenge the naysayers to watch the. – If so moved, won’t you do the same. ….then express an opinion. Otherwise, it is just a propagation of rumors, lies and ignorance. …like talk radio. @Kevin, Sounds like your imperturbable temper was truly tested by those very guilty of moral turpitude. You showed great savoir-faire, of which shows your respectful patrimony, as well as myself. Those involved should resign in the face of the charge of malfeasance. I firmly stand beside you with unyielding faith. I am the mother of two young adults, well-educated and white. I recently graduated from dental college. Blessings to you, kevin. i love this mall. I wish I could go to it all the time. It has all my favorite stores. The only glitch is that i live in Dallas, Texas and i cant just drive 5 hours to San Antonio to go to that mall. I only went to that mall once in July 2010, but only went through the Macy’s and JCPenney wings and i didnt buy anything. 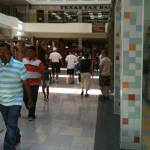 I hope i go to San Antonio again this summer so i can go to North Star Mall. 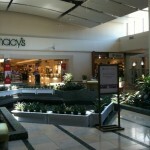 long time i have recalled this place, remember the cool water works at this mall. why are the fountains dry is it do to the drought? oo FUZZY to see the plates. My question is “Why do they not have better video surveillance equipment to help protect their customers from crime happening on their property. I did not have full coverage on my car. MY BAD….Couldn’t afford it. And can’t buy another car. But yet I know, beyond a shadow of a doubt, as well as North Star Mall management knows, that they can afford better protection for their customers. Last I heard from mall security last night was that they were reviewing the camera at the lower level to see if they could get a better view. They took my name. phone, and other info. Haven’t heard from them since. Nice to know they care so much. Beware. Just because they have cameras, doesn’t mean they are up to standards. I recently made a trip to San Antonio and since I had a car and the fact that it’s so close to the airport, I had to make a stop at the North Star Mall. My two main purposes were to see the boots and make a coffee run, just after picking up the car. The boots are quite impressive close up. Earlier up this thread, I made the comments that the renovation seems quite similar to what was done at Paramus Park and The Mall in Columbia – up close, it’s even more apparent. The mall has a lot of quality stores, is quite airy at its two level portions, but sadly, all the fountains in the mall are covered over. While in San Antonio, I also stopped at the Shops at La Cantera; near Fiesta Texas at the intersection of the 1604 Loop (outer) and I-10. This mall is flat-out impressive! It’s basically an upscale mall with the roof torn off. 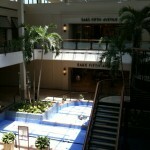 Upscale stores, lots of tropical vegitation and fountains throughout. Also many dining options (didn’t eat at the mall, considering I was staying on Riverwalk and had some of the best Tex-Mex around within walking distance) I really enjoyed the atmosphere of La Cantera and think it can rise to the level of being one of my favorite out-of-state malls!